As high-profile billboards, elevated water tanks stand as easily recognizable landmarks and a great way to showcase the brand of a city or company. And, as intricate and inventive water tank murals continue to become more common, cities throughout North America are starting to coat more than just one tank with a notable design, opting instead to coat multiple tanks throughout the town with similar logos and motifs. 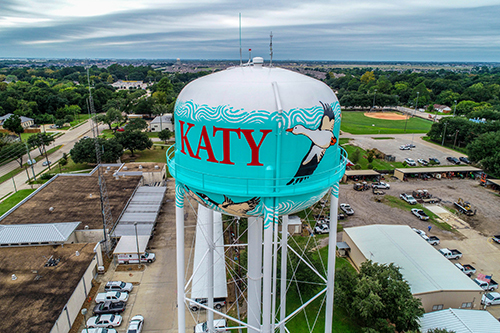 In 2018, the city of Katy, Texas, took this idea to the next level by completing two water tanks with almost identical eye-catching murals, both colorful depictions of geese flying through a bright blue skyline and the city’s name in oversized red letters. And, to help justify their efforts, the tank murals were recognized for their beauty and were awarded the honor of being named as the 2018 Tnemec Tanks of the Year. Two legged tanks in the town, one located off of Franz Road, near the Katy Police Station, and the other near the Katy Mills shopping center, received new exterior coating systems in 2017 and 2018. The tanks are two different sizes, the Franz Rd. 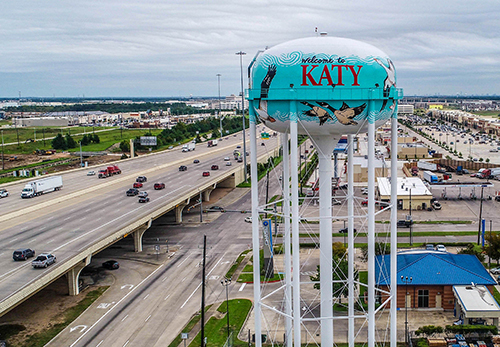 water tank can hold up to 250,000 gallons and the Katy Mills tank, with more legs and a larger diameter, is capable of holding up to 500,000 gallons. The murals themselves were designed by Rolf and Peter Goetzinger based on the City of Katy’s wishes and ideas. The Goetzinger brothers have a long history of creating other water tank murals, having completed highly regarded projects across the country for more than 20 years. The artists are located in Spokane, Washington. After the design was finalized and approved, Peter and his son, Orion Goetzinger, would travel to Katy to begin painting the first tank on Franz Rd. Both tanks were prepared and coated with a high-performance system from Tnemec, including a zinc-rich urethane primer for long-term corrosion protection and an intermediate urethane coating for additional barrier protection. The tanks were topcoated using Tnemec’s fluoropolymer topcoat, Series 700 HydroFlon. Series 700 is formulated to provide long-term color and gloss retention and has been proven to resist the effects of UV light degradation. Peter and Orion utilized Series 700 to paint the mural, too. The Goetzingers have applied Tnemec urethanes and fluoropolymers for years, recently painting other water tanks with the products, such as the Libby’s fruit can tank in Sunnyvale, Calif., and the West Tampa, Fla., tank, which was painted to resemble the wrapping of a cigar. According to an article in the Houston Chronicle, Peter said that the Katy design was one of the most difficult murals they have created, but also one of the prettiest. The larger tank near Katy Mills was completed after the smaller, Franz Rd. tank. To accompany the wider bowl, the Goetzingers added a few more geese and longer text, reading “Welcome to Katy,” into the design. The second tank’s design was also completed using Series 700. After both tanks were completed, the Katy tanks were chosen as the 2018 Tank of the Year winners over 11 other runners-up, including tanks in Cayce, S.C.; Moorhead, Minn.; West Columbia, S.C.; Laurens, S.C.; Winston-Salem, N.C.; Fair Oaks, Ind. ; Lawrence, Ind. ; Dewitt, Mich.; Arvada, Colo.; Fairborn, Ohio; and Hamilton, Ont., Canada. Nearly 270 water tanks were submitted for the contest overall. Several towns, such as West Columbia, S.C., and Orange, Texas, painted multiple tanks with the same general motif in 2018. While other cities, such as Laurens, S.C., and Fairborn, Ohio, submitted new water tank designs just a year or two after completing other highly regarded designs. Tnemec has already begun to see entries for this year’s Tank of the Year contest, which will be announced in October 2019.